I’m a fan of almost anything stuffed inside of a piquillo pepper—so when I found these cod-stuffed peppers this winter I was damn excited. Piquillos, if you haven’t met them before, are the prince of roasted peppers, grown in the Navarre valley in northern Spain, roasted and hand peeled with no water or oil ever added. If you’ve ever tried to roast and hand peel your own peppers, shredding them and leaving tons of burnt pieces attached, you’d never believe it could be done. 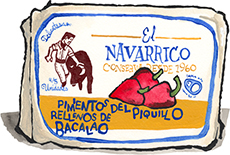 I didn’t, until I visited El Navarrico, our stuffed piquillo maker, and saw it before my own eyes. Amazing! Six women standing side by side peeling peppers faster than you’d peel an orange! Piquillos flavor beats any other roasted pepper, and their flavor is strong enough to handle being stuffed and sauced. Here the stuffing is salt-cured cod, soaked and cooked to silky smoothness and the sauce is a simple rustic tomato sauce. A stellar tapa, all you need to do to make the room swoon is crack open a tin and set it on the table.